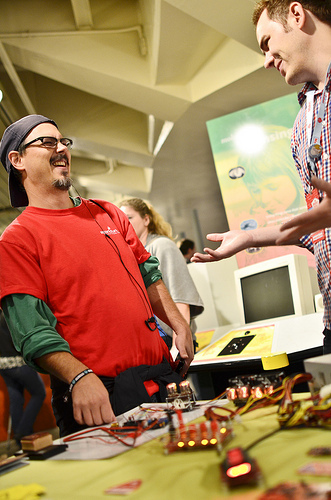 Check out this video from Maker Faire New York! If you've never been to a Maker Faire - go! It's definitely an inspirational experience. You can also check out our Flickr page for some more images like the one above. Lastly, one final reminder that today is the last day to enter our Halloween Costume Contest - check out this page for details on how to enter (and win the major award!). SparkFun Box in (Near) SPAAAAACE! Pete, is that your scare-kids-on-Halloween face? Oh, man. How do I reply to this without sounding a number of ways that I'm not supposed to sound? I'm going to come over there and make a face at you, Toni. I think the point is that your regular face is scary enough, without any effort on your behalf. Besides, I'm sitting next to John's Fat Lady costume. Not really sure any face is going to be more terrifying than that. It is not over yet, but I will. You will know when I start singing. Now if only we can do a Maker Faire in Denver. Agreed! Pull some strings guys, make it happen! John Trepke of TS just went running by in his inflatable fat lady suit and lucha libre mask. Halloween at SFE is something to behold. My lucha libre name is "the bearded lady". I will see you in the TS robot arena ring later, "flying peter". Get out your camera and let us behold then! sound like the making of a caption contest! I have a 7yr old daughter with Type 1 diabeties, She is still kinda new with it. That bare looks to be an awesome tool. As it is with kids they have to act it out in order to help make sence of it and also to help come to their type of terms. So if they could have a friend that they get to poke , prod and monitor would be awesome. The desise is on the rise and to have more items and toys to help them the better. GREAT WORK! keep them coming. Nathan! Darn! Too bad we didn't cross paths at Maker Faire NY. We had a booth for our AeroQuad open source quadcopter project! We build them from Arduinos and design our shields to use sensors from Sparkfun! Please check us out at AeroQuad.com! I'm too worried that if I ever met Nate, then I would owe him in the region of 100 beers. DARN YOU BEERWARE LICENCE!!! I loved Maker Faire NYC!!!! It was great!! Maybe a booth next year for SparkFun?? And I wasn't able to finish my costume this year due to Hurricane Sandy......stuck cleaning up!! But good luck to all!! NoCo Mini Maker Faire is coming! Join us for NoCo Mini Maker Faire! Friday Product Post: You've Been Thunderstruck!